The BBC recently reported about Swedish practises when it comes to putting babies down for a nap. Apparently, it’s common to see prams containing snuggly, sleeping babies lined up outside cafes in temperatures of up to -10°C, while their mums are inside having a coffee. 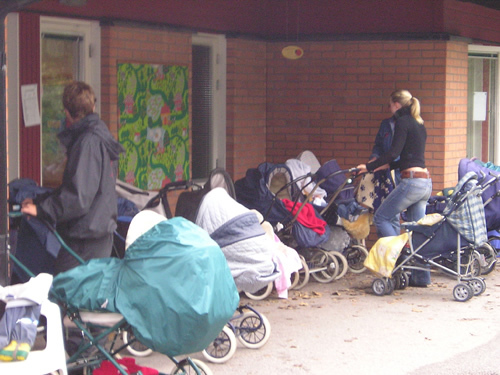 This is so popular that even most day care centres in Sweden will put the babies outside for a nap once a day whether it’s summer or winter. But there is logic behind this unusual tradition – it’s widely believed in Scandinavian countries that the fresh air does wonders for tiny immune systems, and the babies are less likely to catch colds from being in the same room as thirty other children. This lovely celebration originates from less cheerful beginnings. In the days when infant mortality was high, and babies were generally kept indoors for the first three months, the 100-day mark was a real milestone. Nowadays, it’s a lively banquet where the extended family convenes to meet the new arrival and wish it a long and prosperous life – hopefully 100 years! Scraps and squabbles are inevitable in every school, and in Japan teachers are all too aware that quarrels are a natural part of growing up. While in Western culture it’s the norm for an adult to step in, the Japanese way is to leave them to it. By letting them “fight it out” (and only getting involved when things get violent) they believe that children are given natural opportunities to develop socially and work things out independently. In Denmark, reaching their third birthday is a special milestone for children, signalling the end of babyhood and nursery school, and the beginning of Kindergarten – which means saying goodbye to the dummies. We all know this can be a difficult time for both mother and child, but the dummy tree celebration helps relieve the upset. Dummies along with farewell messages are hung on trees, creating beautiful swathes of bright colours – making it a time that little ones look forward to. Playtime is a very different story in the Polynesian Islands. Once a child learns to walk, it’s handed over to older siblings or other children in the community while parents work or get on with other tasks. This allows children to develop parenting skills such as changing nappies, preparing food and comforting the youngest ones – a little like role playing with dolls but with much more responsibility! In India and other Eastern cultures, nappies are considered unnecessary, with most parents preferring never to use them. By paying very close attention, mothers learn to read the signs when their baby needs the toilet, and then holds it over the designated place – and eventually the baby learns to hold back until it’s given the cue. While there are obvious benefits to this (for example – nappy rash is eliminated), it isn’t potty training in its true sense as infants are still unable to wipe and dress themselves! We’d love to hear about your unusual parenting techniques. Perhaps you swear by a little-known tip or trick passed on from generations – feel free to share! I agree with the putting kids outside to sleep- i’ve done it with both my girls and believe they sleep better and the freash air is good for them! My little man is at one of the two Farley Nursery Schools based around Salisbury. As part of their outdoor ethos, where children spend most of their time outside learning and playing, the under 18 months sleep outside for their naps in old fashioned coach prams. They are well wrapped up and sleep so well outside even in the winter, with my little one often in his JoJo polarfleece all-in-one!